Come learn how to build a Tiny House and help homeless youth! 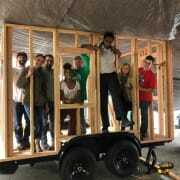 Youth Spirit Artworks is building a Tiny House Village and needs your help. As a build leader, you'll be trained in April to lead a team of 10 volunteers in building a tiny house in the fall. The resulting tiny house village will be a community for homeless youth in Oakland. By the end of the training, you'll know how to build a tiny house from scratch! Please sign up at https://goo.gl/forms/1pQsm6kAzzitwtxr1 or go to youthtinyhousevillage.org for more information. You can also contact hannah@youthspiritartworks.org. Between 2 and 6 weekend days depending on your availability. Some construction or organizing experience recommended.